To this end, I have needed to come up with a LOT of courgette recipes. 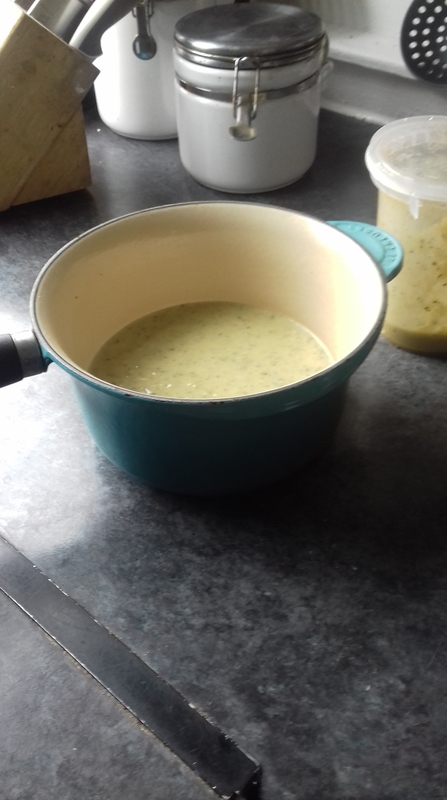 I don’t really fancy them spiralised (which is the trendy treatment de jour), so this week I made soup instead. It’s a very summery soup – courgettes, feta and mint – and you could always make it more substantial with some shredded chicken, or a poached egg on top. Another idea is bacon ‘croutons’. Cut a rasher of bacon into small pieces, fry in a little butter until crispy and use to top the soup. Chop your courgettes into even-sized chunks. Heat the oil in a large sauce pan and add the courgettes. Cook over a gentle heat for about 20 minutes until they are browned and softened. Add the stock and the garlic and bring to a simmer. Cook for another ten minutes. Turn off the heat and add the mint, feta and cream. Stir well, so that the cheese melts. Puree the soup till it’s smooth and season generously with salt and pepper. 15g net carbs per serving.